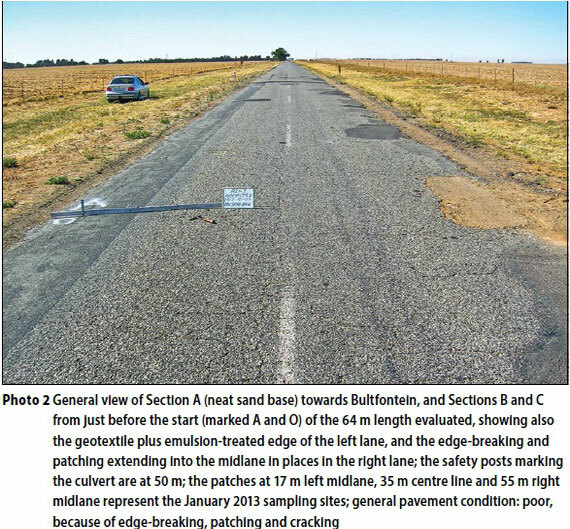 The Hoopstad long-term pavement performance experiments constructed in 1962 between Hoopstad and Bultfontein in the Free State Province of South Africa included a 90 m section of a finegrained, nonplastic, A-2-4(0), aeolian, Kalahari-type sand as unstabilised base course. After 50 years and approximately 1.0M E80 all the experimental sections are still carrying traffic, none has been rehabilitated and none appears to have ever failed. The results of a pavement evaluation carried out in 2013 indicate that similar sand can be used unstabilised as base course for a Category C or D low-volume road designed to carry up to at least 0.1M E80/lane over 20 years, provided it is compacted to refusal or at least 100% MAASHO on a good support, is well drained, well sealed with at least the equivalent of a double seal, and that the shoulders also offer good lateral support and drainage. The seal must also be sufficiently wide to accommodate the traffic expected. Such a design offers tremendous potential for the construction of relatively inexpensive, all-weather, low-volume roads in the vast area of arid and semi-arid southern Africa in which similar sands and a scarcity of gravels occur. Road construction materials other than fine aeolian sands are scarce in the northwestern Free State Province of South Africa, as well as in the vast area of southern Africa covered by Kalahari and similar sands. In their natural state such sands are usually regarded as suitable for use only in the lower pavement layers (e.g. SANRAL 2013). 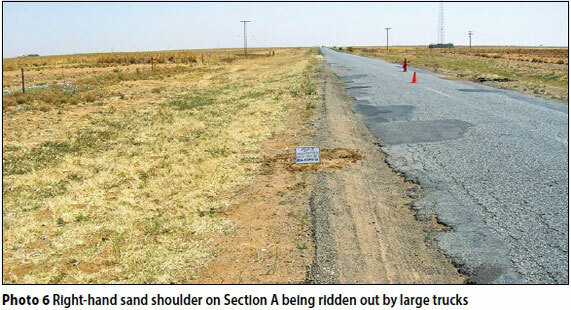 Long-term pavement performance (LTPP) experimental sections were therefore constructed on the Hoopstad-Bultfontein road in the Free State in 1962 to evaluate the use of such sands as base course when stabilised with cement, bitumen and road tar, using sections of unstabilised sand and crusher-run graded crushed stone as control sections (Gregg 1963). 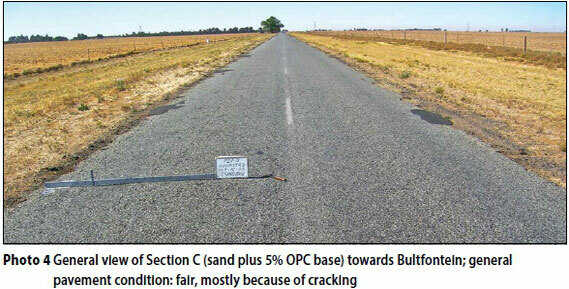 In this paper only the performance of the unstabilised (neat) sand section is reported in comparison with the adjacent 3% and 5% ordinary Portland cement (OPC) stabilised sections, and no attempt is made to review the use of sands in general, for which see Botswana Roads Department (BRD 2010) and Paige-Green et al (2011). Unless stated otherwise, the methods and abbreviations used are shown in the list of references and/or the Appendix. The location, layout and as-built test results of the neat sand base Section A and the adjacent cement-stabilised Sections B and C compiled by the authors from Gregg (1963) are shown in Tables 1 and 2. 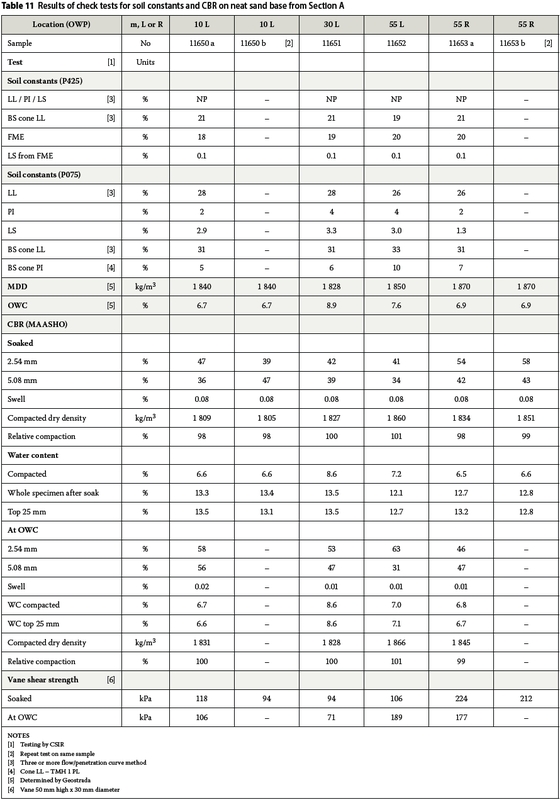 The available test results for the crusher-run section (K), which was not investigated by the authors, are also shown for comparison. All sections had a similar sand sub-base treated with 3% PBFC on a similar neat sand selected layer, fill, and roadbed. All layers were 150 mm in thickness. The test methods used were those of the Department of Transport (DOT 1958) for compaction characteristics, and those later published by the National Institute for Road Research (NIRR 1968) for the indicator tests. In February 1963, eight months after construction, in-situ CBR and Benkelman beam deflection tests were carried out and cores taken for the determination of the cement contents, unconfined compressive strength (UCS) and indirect tensile strength (ITS). The CBR tests were not dynamic cone penetrometer (DCP) tests, but the traditional in-situ tests as described for example by the Road Research Laboratory (RRL 1952). 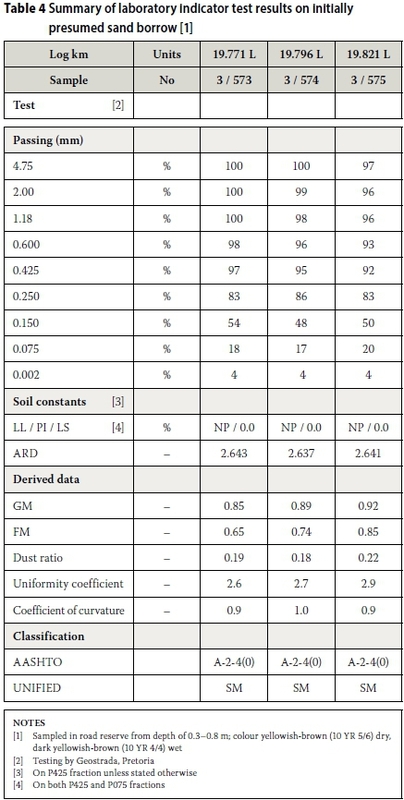 No laboratory CBR was reported for the neat sand and it was simply stated to be a non-plastic (NP), red, silty, fine sand containing less than 1% organic matter (Table 2). ■ Optimum water (moisture) content (OWC) (%) : 9.6 (MAASHO); 11.0 (Proctor) The untreated (i.e. 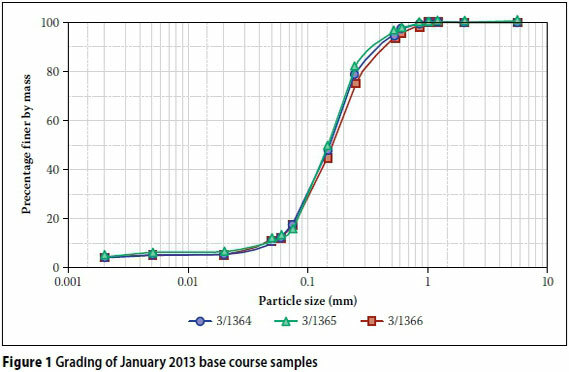 neat) sand had an unconfined compressive strength (UCS) at Proctor compaction of 140 kPa after seven days of curing in a humid room and 1 200 kPa after seven days of "open curing" (static compaction in 102 x 51 mm moulds). The sections were compacted using a 50 ton pneumatic roller followed by a steel-wheel roller, and completed in June 1962. The relative compaction of the neat sand section was not reported, and that of the 3% and 5% OPC sections was only 92% and 90% MAASHO, respectively. At least until about November 1963 all the sections had performed satisfactorily and no failures had occurred, and it was concluded that the unstabilised sand would have sufficient strength to comply with the usual minimum CBR requirement of 80, provided that it was maintained in a dry condition (Gregg 1963). Level measurements apparently taken up to June 1963 showed the maximum settlement on any section to be 13 mm. These measurements, as well as visual observations, were apparently continued up to about 1974, but the records could not be found. According to the surveyor (A Bam 2012, personal communication) no distress had occurred up to that time. Although the neat sand base was nonplastic, the borderline A-2-4(0) classification, the high mean in-situ CBR of 81, and the presence of a significant UCS, especially after drying, indicated that this sand was not the usual cohesionless A3 sand, but did have sufficient strength for base course. At the same time the low mean, soaked, in-situ CBR of 29 indicated the critical necessity of avoiding saturation. If the lower axle load used to measure the deflection and radius of curvature (ROC) is allowed for, the corrected deflections and radii of curvature of the deflection bowls of about 0.3 mm and 90 m for Section A respectively, were all within the sound range of 0.6 mm and > 80 m for a modern, untreated base on a treated sub-base for a modern Category C road, according to the criteria in TRH 12 (COLTO 1997), by which criteria Section A would be expected to have a structural capacity in excess of 5M E80. Preliminary work confirmed the presence of the neat sand section in a fair condition, a still substantial life, and adequate laboratory soaked and unsoaked CBRs (Table 3 and Figure 1). The visually identical sand in the road reserve (Photo 1) was also sampled and tested (Tables 4 and 5). This work was judged sufficiently encouraging to proceed with a full pavement investigation. During October/November 2013 a more detailed pavement evaluation was carried out comprising visual evaluation according to TMH 9 (CSRA 1992), measurement of degree and extent of cracking, patching, edge-breaking and rut depths; DCP tests to 800 mm or refusal; profiling; phenolphthalein and acid tests; and sampling of the base at four sites in the outer wheel paths on Section A and two each on the other sections. General views of Sections A, B and C towards Bultfontein are shown in Photos 2, 3 and 4. In all cases the 30 mm thick seal was found to consist only of the original triple seal plus one reseal. On all sections the binder of the reseal was still good, i.e. Degree 1 / Extent 5 (D1/ E5), and there was little bleeding (D2/E5), but severe and extensive map to hexagonal to block (D5/E5) cracking at an average spacing of about 1 m over the full width, and crocodile (D4-5/E 3-5) cracking occurred in all wheel paths and extended across the centre line. The cracking was confined to the seal, was usually only 10-15 mm deep, and did not penetrate into the base course at any of the sites excavated or at the additional cracks tested. Although often spalling to a width of 10 mm, the actual width of the cracks was only 1 mm or less. Longitudinal cracking and pumping were absent, rutting was minimal (D2-3/ E5), there were no undulations, and patching was almost entirely confined to the edge-breaking and edge-cracking, which was severe (D 3-5) and extensive (E 4-5) on all three sections. Some secondary cracking was evident on Sections B and C only, especially in the left lane, but was less extensive on Section C.
There was no evidence of shear failures (the patches appeared to be all due to large edge breaks) or even excessive rutting (except on the sand shoulders), and the main problem was edge-breaking due to the seal being now too narrow for the large trucks currently using it (Photos 5 and 6). This was worst on Section A, where the value of the geotextile and emulsion holding the seal in the left lane was evident. The riding quality was assessed as only fair because of the edge breaks and patching. The surface drainage was assessed as adequate and the grassed sand shoulders as safe. The road had been built with a camber and the edges of the seal were about 80-130 mm below the centre line, giving an effective total crossfall of about 3-4%. The centre line of the road was about 500 mm and 300 mm above the side drains on the left- and right-hand sides, respectively. The fall of the natural ground level in the 30 m wide road reserve was about 0.5 m from right to left. The alignment was straight and practically level, with a fall of only about 0.2% from the end of Section C to the start of Section A. Further details of the cracking and patching and the rut depths are shown in Table 6. As the road had been built with a camber the rut depths were measured in two ways. The end of the straight edge was first placed in the normal way on the edge of the seal or on the centre line, and the deviations under the ends recorded as 'edge' and CLL or CLR, respectively, while the maximum deviation in the wheel paths was recorded as the rut depth (OWP or IWP respectively). Then the straight edge was held down on the edge or the centre line and the deviations in the wheel paths re-measured and recorded as OWPH or IWPH. The latter procedure usually yielded the smaller deviations and may be a closer representation of the true traffic-induced rut depths. The general pavement condition was assessed as poor on Section A and fair on Sections B and C, with C slightly better than B. The inspection panel recommended that the edge-breaking should be patched at an A priority and the shoulders gravelled (or at least bladed), the seal softened and rolled in hot weather to seal the cracks, and the road resealed at a B priority. However, damage to the edges must be expected to continue, as the road is simply too narrow for the large trucks currently using it. The results of the rut depth and DCP surveys in the outer wheel paths are summarised in Table 7. As the DCP results for both wheel paths were similar, they have been combined to total six points on Section A and B, and five on Section C (one was invalid). The analysis was carried out by means of the EasyDCP program (J Lea 2013, personal communication) using the Kleyn granular base model (De Beer et al 1989) for Category C and D roads (i.e. 80/20 and 50 percentile (%-ile) basis respectively) and - conservatively assuming an optimum moisture condition - considering that the survey was carried out at the end of the dry season when the field water content (FWC) was about 50% of the MAASHO optimum (OWC). An example of the output of this program for a 20 %-ile DN of 7.0, an 80 %-ile DSN800 of 185 and a predicted 20 %-ile structural capacity of 2.6M E80 for Section A (in the 10 m right outer wheel path) is shown in Figure 2. 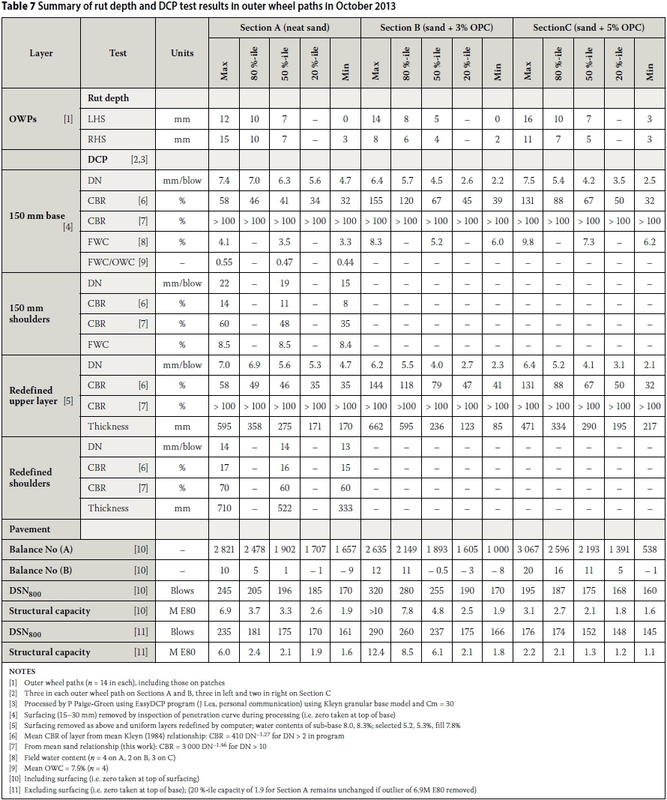 For comparison, the required DCP profile for a Class II rural road pavement designed for 0.10-0.30 M MISA (i.e. actual 80 kN standard axles) of the former Transvaal Roads Department (1994) is also shown. For simplicity and ease of comparison the granular base model has been used on all three pavements. Although it tends to over-predict the structural capacity of cemented pavements (De Beer et al 1989) it can be used on them (Kleyn & Savage 1982; COLTO 1997). of more than about 34% according to the Kleyn model, or over 100 according to the Hoopstad model (Figure 3 in this paper). 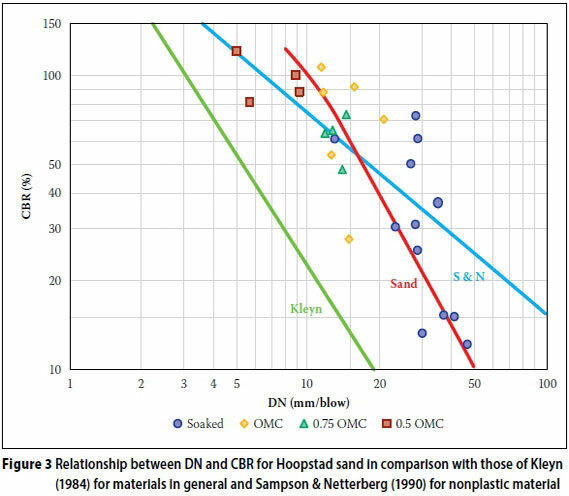 With similar 80 %-ile DNs of about 5.5 and 20 %-ile CBRs of about 45 (or over 100), the two cemented bases were not greatly stronger than the uncemented base, both in the assumed 150 mm and in the redefined cases. This suggests that the in-situ CBR of the neat sand base was far higher than that indicated by the Kleyn model, and thereby offers a plausible explanation for its unexpectedly good performance. The 20 and 50 %-ile redefined thicknesses of similar strength to the base of 171 mm and 275 mm respectively indicate that most of the originally cemented sub-base on Section A had reverted to a granular state and was by then operating at the same strength as the base. Experience with respect to the usual rates of carbonation (Netterberg 1991) suggests that, regardless of traffic, this would actually have been the case from about year five to ten. The upper 150 mm of the shoulders on Section A had a 50 %-ile (in this case a mean) DN of 19, indicating an in-situ DCP CBR of about 11 according to the Kleyn model, and 48 according to the Hoopstad model. The redefined case indicates that the whole 522 mm had a mean DN of 14, indicating a CBR of about 16 (or 60) and therefore good lateral support both to the base and lower layers. This conclusion is also supported by the minimal rutting of the sand shoulder shown in Photo 6, which is far less than would be expected from a nonplastic sand. The 80 and 20 %-ile pavement balance numbers A of about 2 500 and 2 100, and B of -1 and -5 for Sections A and B respectively, indicate that both pavements were averagely balanced and marginal to inverted deep pavements, and that the Kleyn model requirements of a good (or apparently at least an average balance) have been at least marginally met. With respective A and B balance numbers of 2 600 and 5 Section C was an averagely balanced deep pavement. The predictions of the remaining structural capacities of the pavements depend somewhat on whether the zero point of the DCP is taken at the top of the seal according to TMH 6 (NITRR 1984) or at the top of the base, which is where it was taken during the testing from which the Kleyn model was developed (E G Kleyn 2010, personal communication). As the 80 %-ile rut depths of all three sections were also only in the 6-10 mm range they were all sound according to TRH 12 (COLTO 1997). Sections A and B have a similar residual capacity of about 2M and C about 1M E80 to an additional rut depth of 20 mm. Assuming proportionality, this indicates that the remaining capacities to a total rut depth of 20 mm of the three sections are about 1.0 for Sections A and B and about 0.5M E80 for Section C.
If all of the 13 available DCP results are considered, the lowest predicted 20 %-ile capacity of all 10 of the DCPs carried out in October of 1.7M E80, and the three single points in January 2013 of 0.9M E80, indicate a residual capacity for Section A of at least about 0.5M E80. As the Kleyn model is an average prediction the most conservative view would be to halve this again. On this basis it can be concluded with a high degree of certainty that the residual structural capacity of Section A to a total rut depth of 20 mm (i.e. an additional 10 mm) at an in-situ water content of OWC is at least about 0.3M E80. If it were to become saturated this would be halved to about 0.1-0.2M E80. The capacities of the cemented base sections must be regarded as more approximate, as they have not been checked by the De Beer model (De Beer et al 1989) for cemented pavements. The low degree and extent of rutting, the absence of shear failures (at least at the time of the two site visits), the absence of base course patching found in any of the six holes and 13 DCP points, the reasonable DN (and apparently very good in-situ operating CBR of over 100) and the predicted residual structural capacity of at least about 0.3M E80 all indicate that the further use of such a sand as untreated base course for a low-volume road is viable under similar conditions. As most of the sub-base was operating at about the same strength as the base it should not be necessary to treat it with cement, provided that it is compacted to a similar strength and that this support is sufficient to achieve the necessary high degree of compaction of the base. Comparison with the Transvaal Roads Department (1994) design (the dashed red strenth line shown in Figure 2) shows that the 20 %-ile example on Section A met all the requirements of all layers for both the 150 mm layer and the redefined cases, except that of the base for which a DN of 2.8 was required, whereas only 7.0 was found. 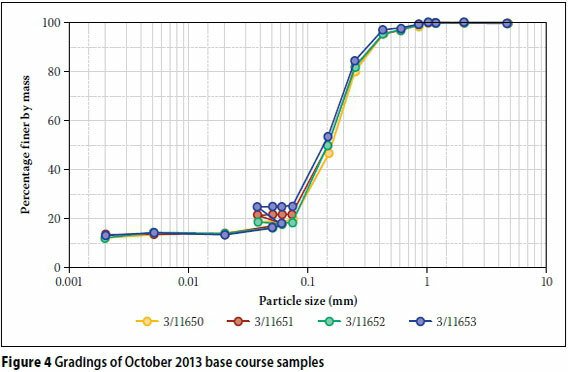 The pavement profile was confirmed to be approximately as reported (Photo 7) and was sampled and tested (Table 8, Figure 4 and Table 9). ■ Much higher apparent in-situ CBRs (of over 100) than the 34-58 indicated by the Kleyn model. ■ High relative compactions in the wheel paths of about 99-100%. ■ No plasticity on the P425, but SP-6 on theP075 using the Casagrande cup method. ■ Good laboratory soaked CBRs of about50-60 at 100% MAASHO and 70-90 athigher compactions. ■ Very good laboratory unsoaked 100% MAASHO CBRs of over 80% at water contents of OWC and less - the apparent in-situ condition. 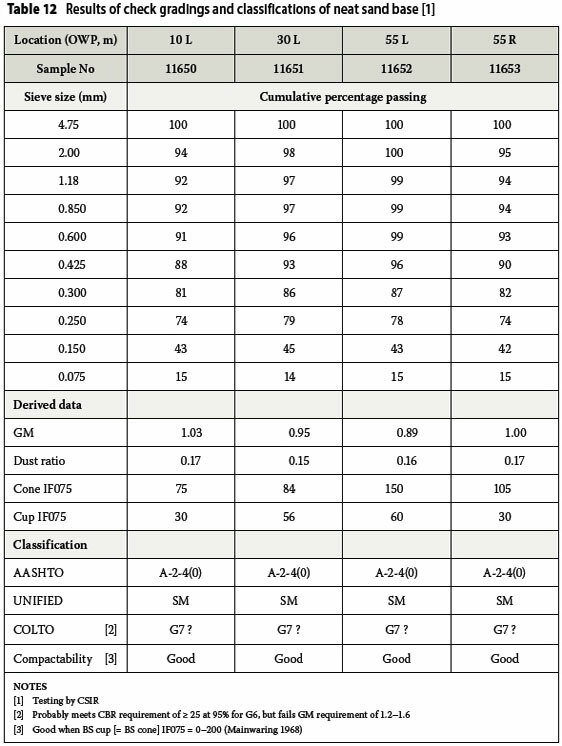 ■ AASHTO and Unified classifications of A-2-4(0) and SM, respectively, but only COLTO G7 (because of the fine grading). A substantial depth of prime penetration of some 10-20 mm was noted, suggesting that a higher than normal rate of application may have been used. The sub-base and lower layers were subjected to minimal testing as (except for the cement treatment of the sub-base) they were visually similar to the untreated sand base (Table 10). The main differences were that the sub-base had been rendered nonplastic even on the P075 fraction and that its SE was much higher than the other layers (as well as the base). Check testing of the most important soil properties of the four samples of base course taken in October 2013 was carried out by the CSIR in Pretoria on material that had already been used at least once for compaction-related tests and subsequently air-dried (Tables 11 and 12, and Figure 5). 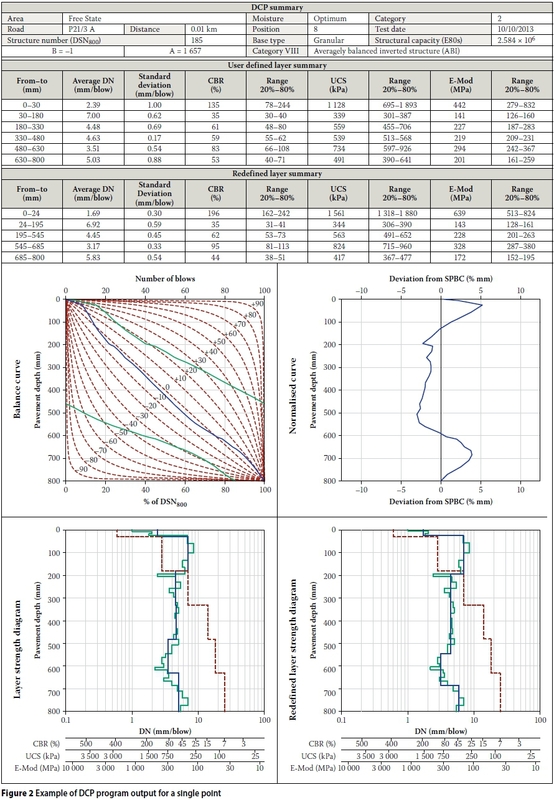 Here the liquid limits were determined by the more accurate TMH 1 flow curve method in the case of the Casagrande cup method, and the BS 1377 penetration curve method in the case of the cone method. As no cup liquid limit could be obtained on the P425 fraction, the LS was determined from the FME instead. The soaked CBR was determined in duplicate on two samples. As an additional measure of the compacted strength of the material, the shear strength was determined by theTMH 6 (NITRR 1984) vane method after determination of the CBR, with the top of the vane at least 50 mm below the top of the specimen. Both the soaked and unsoaked vane shear strengths show a reasonable correlation with their respective CBRs, although they lie on different curves (not shown), suggesting that this is a viable alternative test for fine sands. Strengths of 94-224 kPa were achieved at 97-101% compaction after soaking, but only 71-189 kPa at 98-101% at OWC, apparently due to disturbance on inserting the vane. For comparison, the recommended minimum vane shear strength of sand-asphalt at 40 °C is 200 kPa at 100% MAASHO density (NITRR 1985). However, minimum in-situ strengths of only 100 kPa at 40 °C at only 90% proved adequate for up to 0.1M E80, 120 kPa for up to 0.2M E80, and 200 kPa at 93% for up to an extrapolated 0.5M E80 on a seven-year-old Kalahari sand-asphalt road experiment in Botswana (Netterberg 1989). The results of the check tests by the CSIR on the gradings and CBRs show that, although somewhat coarser and lower respectively, they agree reasonably with those by Geostrada, the samples remainedNP on the P425 and SP on the P075, andtheir AASHTO and Unified classifications were unaltered. It was therefore concluded that the reuse of this particular material resulted in no significant change in its properties, and that the results of the Geostrada and CSIR tests on reused material were valid. It has been known for many years that the shear strength of a non-cohesive sand consists of two parts, the internal frictional resistance between grains (a combination of rolling and sliding friction) and interlocking, which is particularly important in densesands (Taylor 1948). 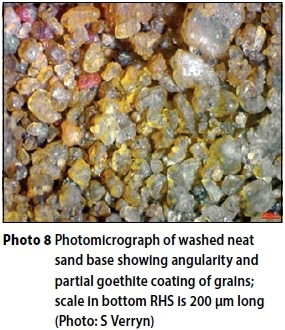 A photograph of the particles of a composite sample of the neat sand base as seen under a stereo microscope (Photo 8) showed that they were angular in shape. 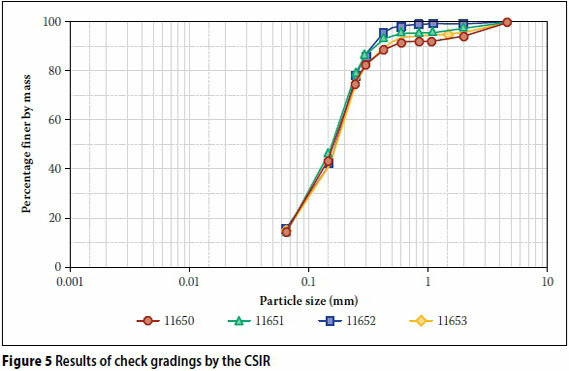 In an attempt to quantify this the ASTM C 1253-93 particle angularity test used in the concrete and asphalt industries was carriedout (Table 13). The results on the whole grading and the plus 075 urn fraction are not significantly different. In terms of the criteria used by the South African asphalt industry (TCAM van Rijckevorsel 2013, personal communication) 35% would be regarded as round, 45% as average and 65% as very angular - the results of 47-50% found would only be regarded as slightly more angular than average, but adequate for a sand for use in normal asphalt mixes. In order to ascertain whether the outstanding performance of the pure sand base was due to some unusual composition it was also characterised by chemical and mineralogical analysis. The results of tests for organic carbon, pH, paste resistance and sulphate content (not shown) did not indicate any unusual properties. The P002s of 5-6% found on the base using the more accurate pipette method were much lower than the 13-14% reported by Geostrada on the same samples (Table 9), but were comparable with those of the January samples also tested by them (Tables 3 and 4). The results (not shown) showed that the neat sand was composed mostly of about 90% SiO2 occurring as quartz (SiO2), 4% total Al2O3as kaolinite clay and felspars, with about 1.5% total Fe2O3 as goethite, FeO(OH), and that all of these minerals (and some muscovite mica), except quartz, were more concentrated in the P075 fraction. Little or no CaCO3 was present. The citrate-bicarbonate-dithionite (CBD)-extractable Al, Fe and Mn (i.e. present as free oxides/hydroxides) in one composite sample of neat sand base were 0.09%, 0.51% and 0.12% calculated as Al2O3, Fe2O3 and MnO respectively. It seems that these small amounts of kaolinite and goethite were sufficient to account for the cohesion and to contribute towards the high strengths of the sand, particularly when unsaturated, and the good performance of the neat sand base, as well as the neat sand shoulders. An estimate of the traffic history of that part of the road, including the experimental sections, is shown in Table 14. Only eight counts were available for the total of 50 years, and none at all for the first 20 years between 1963 and 1995. A heavy vehicle growth rate of 6% per annum from an initial 10% of the AADT (i.e. 15 hv/d) as recommended by the former Transvaal Roads Department (1994) for this class of road was therefore assumed, which also agreed well with the count of 120 hv/d in 1995. Although the calculations are accurate, they nevertheless must be regarded as only giving an approximate indication of the cumulative number of standard axles (E80) carried since construction. As practically no information is available on the early buildup of traffic, or on the traffic split, it is safest to assume that the sections had carried about 0.1M E80/lane in the first 20 years, about 0.2 in 30 years, about 0.5 in 40 years, and about 1.0 M in 50 years. During both site visits a significant number of six- and seven-axle multi-trailer vehicles travelling in both directions were noticed. A two-day count of these alone in June 2014 averaged 35/day travelling towards Bultfontein and 30 towards Hoopstad, all approximately 75% loaded (J Nkabinde 2014, personal communication). There is no overloading control on this road and no other split counts were carried out. The use of such vehicles apparently commenced in about 1996 and runs throughout the year, with the greatest number during the months of July to December, and with the degree of loading approximately equal in both directions. Assuming an average load equivalency factor (LEF) of 6.0 per vehicle for these trucks obtained from an HSWIM count in 2007 on a similar road in a similar farming area, it was estimated that these vehicles alone contributed about 180 E80/lane/day or about 50 000 E80/lane/year, and at least one half of the total cumulative E80 carried up to 2013. The original surfacing was a triple seal. As far as can be ascertained the road was only resealed once with a single reseal in 1986, and received one rejuvenation spray at an unknown date. The presence of only the triple seal and a single 13 mm reseal was confirmed in all the many trial holes, DCP points and edge breaks examined on all three sections. All of the sections, especially the neat sand section, had also been extensively patched (Photos 2-5), although this had largely been confined to the outer 0.5-1.0 m in both lanes due to the severe and extensive edge-breaking. No evidence of base course patching was found. The edge-breaking had apparently been worse on the Bultfontein-bound lane of the neat sand section where a 40 m length of the outer 1.0 m had been repaired with a geotextile and a bituminous emulsion in about 2007 (Photos 2 and 5). This was holding up well and appeared to be a viable repair option. According to the map of macroclimatic regions of southern Africa (Figure 4 in TRH 4 - COLTO 1996) and in the South African pavement engineering manual (SANRAL 2013), the experiment lies within the "dry" macroclimatic region for pavement design purposes. However it lies close - about 50 km - to the boundary between the dry and moderate macroclimatic regions. ■ Weinert's (1980) N-value: 5.5. ■ Thornthwaite: Dry semiarid warm, moisture deficient in all seasons (Schulze 1947), with a moisture index (Im) of minus 21-22 (Schulze 1958, confirmed from Emery 1992, and Council for Scientific and Industrial Research (CSIR 2009)). ■ Koppen: BSk, (semiarid steppe), with the dry, cold season in winter (Schulze & McGee 1978) and calculated from Table 16; borderline BSh (semiarid hot). Hail and fog are rare and snow almost unknown. 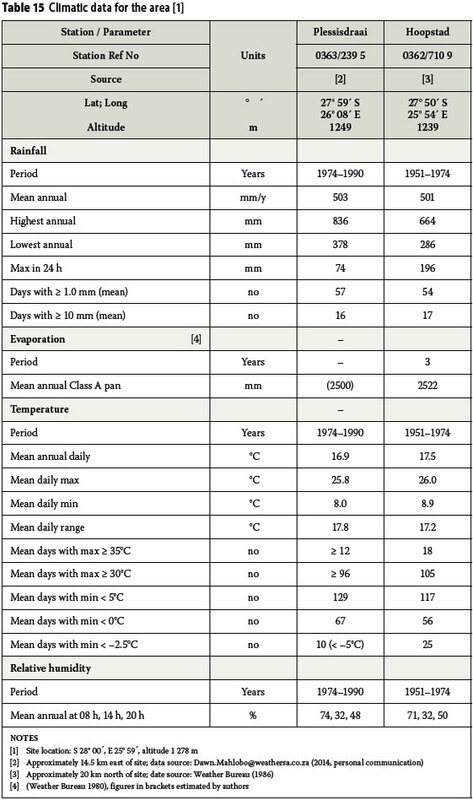 Further details of the climate of the area and the rainfall received during almost the full 50 years of the experiment are shown in Tables 15 and 16. Because the site lies at approximately the wet limit in terms of rainfall, Im and N-value of the occurrence of most Kalaharitype sands, the results of the experiment should be conservative as far as the climatic factor is concerned. They should therefore be conservatively applicable to Kalaharitype sands almost everywhere in southern Africa. The topography of the area is flat and at an altitude of about 1 280 m. No rock outcrops are shown on the 1:250 000 geological maps (Council for Geoscience 1993, 1994), and the surface material is shown simply as quaternary aeolian sand of unspecified depth, and the underlying geology as shale and subordinate sandstone of the Ecca Group of the Karoo Supergroup, intruded in places by Jurassic dolerite. The soil maps of the area (Land Type Survey Staff 1986, 2012) show the soils of the area to be red-yellow in colour, apedal, freely drained, with a high base status, and with a "clay" (i.e. passing 2 μm) content of usually less than 15%. 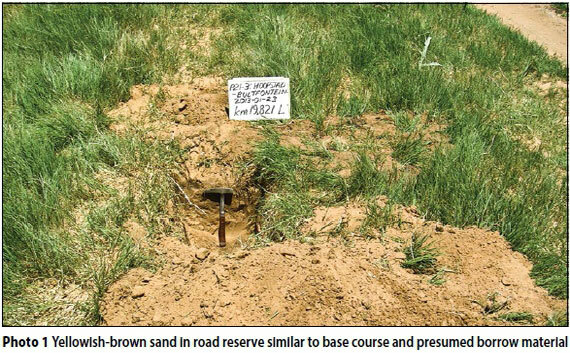 These soils are deep, sandy, aeolian soils of the Hutton soil form in the Kalahari vegetation unit and mostly of the Avalon soil form in the Grassland unit, which latter was confirmed by the three pits dug in the road reserve between km 19.7 and 19.8 (Photo 1), together with the laboratory test results on samples from both these pits (Table 4). Such soils are characterised by their yellow-brown colour, well-drained, fine sandy nature with a low clay content (< 6%), but with seasonal wetness. Local information indicates that the permanent water table lies at a depth of about 30 m, but that a perched water table can develop at a depth of about 2 m due to an underlying layer of clay - presumably the residual shale. ■ Minimum CBD-extractable Fe: 0.3% or, less reliably, minimum Fe2O3 content by XRF analysis: 1.2% Fe2O3. ■ Dominant clay mineral: kaolinite. ■ Base to refusal, or at least 100% MAASHO, whichever is the lesser. As there were no failures, the material specifications simply attempt to circumscribe the apparently desirable properties of the material tested, and it is uncertain which can be safely omitted - or which perhaps still need to be added. The purpose of specifying colour is to ensure that there are some suitable iron oxide/hydroxide minerals present and to act as a field proxy for chemical analysis, which is difficult to get done by the more desirable CBD method, and which cannot be done on site. The most essential requirements would appear to be to have at least about 10% P075 with just sufficient plasticity to provide some cohesion to allow good compaction, stability during construction, and an adequate CBR, both soaked and unsoaked, as well as a sufficiently stiff platform for compaction. The use of a more sophisticated grading specification, such as that of the Botswana Roads Department (BRD 2010), involving phi grading units does not appear to be necessary. The limitation of the design traffic to about 0.1M E80 at this stage of our knowledge is deliberately conservative in view of the absence of traffic counts over the first 20 years, the well-known beneficial effects of slow remoulding by traffic (Van Niekerk 1953; Kleyn & Savage 1982; De Beer et al 1989), and the uncertainty both regarding the correct load equivalency exponent, and the degree to which the original triple seal and the later reseal - currently a total of 30 mm - may have acted as a structural layer. 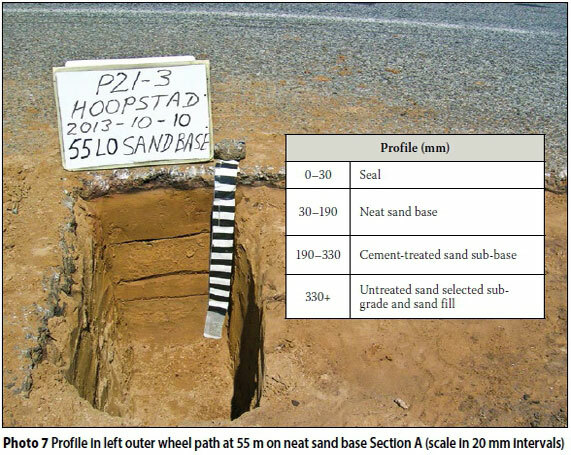 Sand bases with a capillary-soaked triaxial class of 3.3 at intermediate compaction have been used in Zimbabwe for roads designed to carry up to 0.1 M E80 in both directions over10 years (Mitchell et al 1975; Mitchell 1982).However, although the Hoopstad samples tested would meet the equivalent soaked CBR requirement of about 35-55, their gradings are too fine. A novel approach to the selection of sands in West Australia using sedimentological phi (Φ) units instead of mm for particle size characterisation in terms of the mean and standard deviation, is that of Metcalf and Wylde (1984). Plots of the Hoopstad samples (not shown) showed them to all fall outside of their Zone B (which included most successful sealed bases) due to insufficient fines. Although the Hoopstad sand might have met the CBR requirement, it would have failed this specification on account of its unsatisfactory LS/Φ ratios of less than 5 (LSs all too low) and an AL2O3+ Fe2O3content of less than 8%. This investigation has shown that, as predicted by Gregg (1963), provided that it does not become saturated, a fine, A-2-4(0) aeolian sand with sufficient fines of low plasticity and a good CBR can be used as untreated base course for a low-volume road with an expected life of more than 20 years. 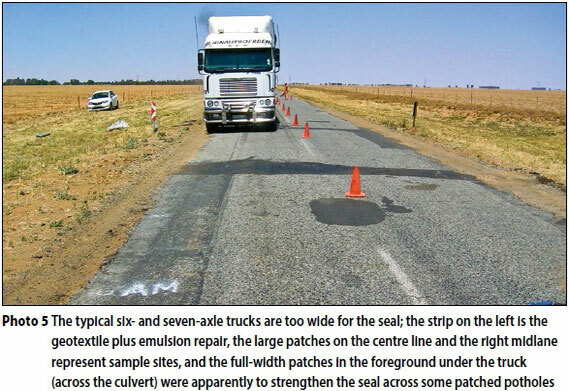 This finding should go some way towards the provision of low-volume sealed roads in the vast area of arid and semiarid southern Africa covered with similar sands and devoid of conventional gravels. This investigation was funded by UKaid from the United Kingdom Department of International Development, through the Africa Community Access Programme (AFCAP), which promotes safe and sustainable access to markets, healthcare, education, employment and social and political networks for rural communities in Africa, endorsed by the Association of Southern African National Roads Authorities (ASANRA), and managed by the Crown Agents (Project Technical Manager: Mr R Geddes). It formed part of a southern Africa-wide project on the increased use of sands in low-volume roads under the auspices of ASANRA (www.asanra.int.mw). A more comprehensive report is available (www.afcap.org). The site work was carried out by a team from the Free State Department of Police, Roads and Transport under the authors' supervision. This paper is published with the permission of the above authorities, but the views expressed do not necessarily reflect those of the above, or their official policies. The experimental sections were constructed as a joint project between the Department and the CSIR. Most of the laboratory engineering testing was carried out by Geostrada Engineering International (Pty) Ltd, with some check testing at the CSIR Division of Built Environment, and the Institute for Soil, Climate and Water, all in Pretoria. The particle angularity tests were kindly carried out at no charge by Much Asphalt (Pty) Ltd in Benoni (Mr H Marais). The project also benefited from the assistance of Dr P Paige-Green and Mr MI Pinard. DR FRANK NETTERBERG Is an Independent researcher and specialist consultant on pavement materials and geotechnics. He graduated with a BSc in Geology in 1960 from the University of Cape Town, a BSc Hons in 1963 and a PhD in 1970, both in Engineering Geology from the University of the Witwatersrand, and is a Chartered Engineer and Geologist, a registered Professional Scientist, a Fellow of ICE and SAIEG, and a Member of SAICE and AEG . He has been employed by mining companies, consulting engineers, the CSIR and the University of the Witwatersrand. His research and consulting interests include marginal and unusual materials, pedocretes, soluble salt damage, stabilisation, and active clay roadbeds on which he has published many papers and for which he has received a number of awards. DEIRDRE ELSMERE is a Control Engineering Technician with the Department of Police, Roads and Transport in the Road Construction, Material Design and Quality Control Sub-Directorate, which includes a Soils Laboratory. She graduated with a BSc in Geology in 1984, an Hons BSc in 1985 and an MSc In Geology from the University ofthe Free State (UFS). She was employed by the Department of Geology at the UFS as a Junior Researcher from 1984 until 1993. She currently coordinates and disseminates design specifications and policies for road building materials and geotechnical works, manages consultants and in-house staff, and evaluates reports, strategies, solutions and specifications prepared by them. ■ Bar Linear Shrinkage (LS): TMH 1: 1979 (National Institute for Transport andRoad Research) (NITRR 1979). ■ British Standard Vibrating Hammer (BSVH): BS 1377: 1990: Part 4 (BritishStandards Institution) (BSI 1990). ■ California Bearing Ratio (CBR): TMH 1: 1986 - in accordance with normal South African practice, unless otherwise stated, at a specified percentage of compaction relative to the MAASHO MDD, at a penetration depth of 2.54 mm after soakingfor at least four days (NITRR 1986). ■ Carbonation and presence/absence of cement using 0.5% phenolphthaleinsolution and diluted hydrochloric acid(HCl) (Netterberg 1984), except that 1.2N HCl was used instead of the previously recommended 5 N, as it has subsequently been found to be more sensitive. ■ Compactive effort: TMH 1: 1986: Modified American Association ofState Highway Officials (MAASHO),i.e. 2 413 kJ/m3 (which is less than the current heavy American Association of State Highway and TransportationOfficials (AASHTO) T180 effort of2 695 kJ/m3); National Road Board (NRB, i.e. Intermediate), i.e. 1 096 kJ/m3; and Proctor, i.e. 531 kJ/m3 (Department ofTransport) (DOT 1970). ■ Cone Liquid Limit: BS 1377: 1990: Part 2. ■ DCP tests on CBR specimens: Average DN through specimen after CBR test, with annular weight in place as usedby EG Kleyn (1984), (2013, personalcommunication), and Sampson and Netterberg (1990), with the cone zero at the bottom of the CBR indentation and with heave measurements during test (which were usually zero, rarely up to 4 mm). ■ Dynamic Cone Penetrometer (DCP): TMH 6: 1984 (NITRR 1984), with the cone zero at the top of the seal. ■ Field Moisture Equivalent (FME): AASHTO T93-86 (1936), (AASHTO 1998a). ■ Fineness Index (FI075, FI075): P075 x PI075 (Mainwaring 1968). (Note: WhenPI075 = NP or 0, then FI075 = P075). ■ Fineness Modulus (FM): [600 - (P5000 + P2000 + P1000 + P600 + P300 + P150)]/ 100: South African National Standard(SANS) 3001-PR5: 2009 South AfricanBureau of Standards (SABS 2010). ■ Grading modulus (GM): (R2000 + R425 +R075) / 100 (Kleyn 1955); or ■ [300 - (P2000 + P425 + P075)] / 100(SANS 3001-PR5: 2009) (SABS 2010). ■ Laboratory test methods in general:TMH 1: 1986 (NITRR 1986). ■ Particle angularity: ASTM C 1252 - 93(ASTM 1995). ■ Sieve analysis: TMH 1: 1986 MethodA-1(a). ■ Hydrometer analysis: GeostradaPretoria Method MT 1. ■ P425, P075, etc: Cumulative percentage passing 425, 075 μm, sieves, etc. ■ R425, R075, etc: Cumulative percentage retained on 425, 075 μm, sieves, etc. ■ Sand equivalent (SE) (on whole grading):SANS 3001-AG5: 2013 (SABS 2013). ■ AASHTO M 145-91 (1995) (AASHTO1998b). ■ COLTO: 1998: Section 3400 (Committee of Land TransportationOfficials 1998) (COLTO 1998). 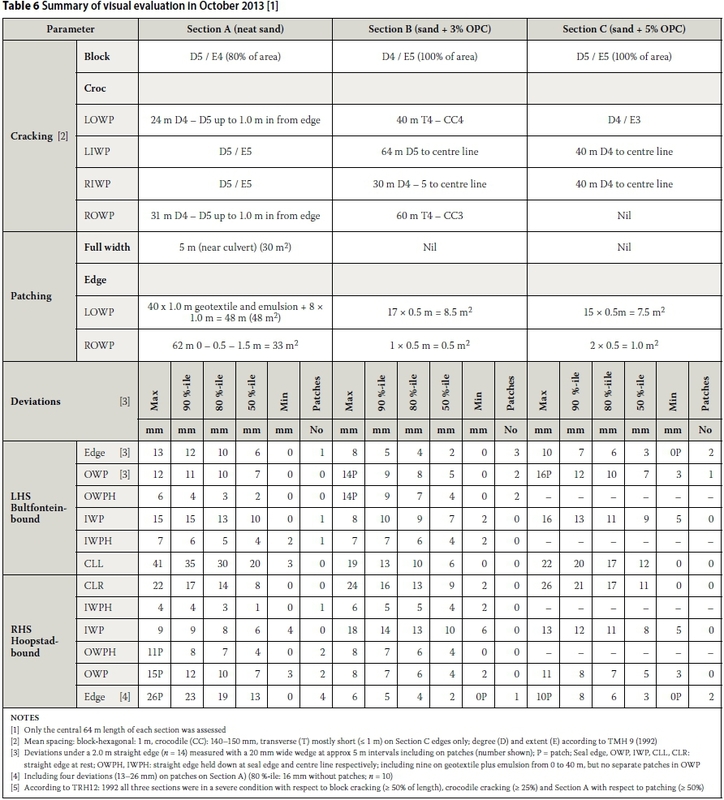 ■ Unified: ASTM D2487-11 (ASTM International 2013). ■ Passing 0.425 mm fraction (P425) forsoil constants: TMH 1: 1986 MethodA-1(a). ■ Passing 0.075 mm fraction (P075) forsoil constants: SANS 3001 - GR1: 2008 (SABS 2008). 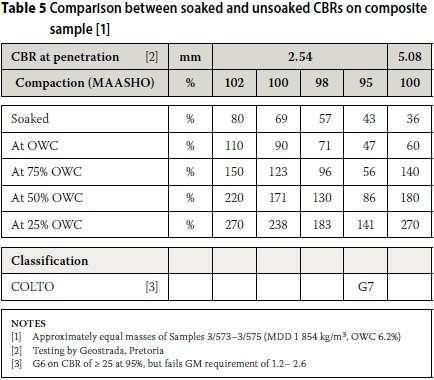 ■ Unsoaked CBR: At optimum watercontent (OWC) for MAASHO effort afterfour days equilibration in sealed plastic bags; at less than OWC after drying in the sun or oven at ≤ 60 °C to the approximate percentage OWC specified and then sealing in plastic bags for at least four days. ■ Visual assessment of the road: TMH 9: 1992 (Committee of State RoadAuthorities) (CSRA 1992). ■ pH, paste resistance, dithionite-citrate-bicarbonate (CBD) - extractable free iron (Fe), aluminium (Al) and manganese (Mn) oxides/hydroxides; organic carbon (by Walkley-Black dichromate oxidation), and particle size distribution (washed sieve plus pipette method): The Non-AffiliatedSoil Analysis Work Committee (1990). ■ Soil colour: Standard Munsell colours (Soil Colour Chart compiled by Soils Research Institute, Pretoria, undated; Munsell Color Co, Inc, Baltimore.